February the month of love! This month Little Voices is all about ‘love’ and that is quite fitting since it is the month of Valentine’s Day. We strive all year round to get feedback from everyone involved with Little Voices so that we know what we are doing well and how we can improve. Our parents constantly tell us why they love Little Voices, our tutors help us to constantly improve and our franchisees are passionate about getting it right and helping us to grow and improve year upon year. Feedback is king; whilst it helps us to strengthen it also highlights what people love about us. Our national feedback from every Little Voices centre provides some of the most valuable insights into our pupils, parents and tutors thoughts. The one thing that is highlighted time and time again is that Little Voices really cares about each individual child. Each franchisee and tutor really love what they do and their enthusiasm for Little Voices shines through. This in turn makes children and parents feel warmly welcomed into lessons. If a child feels happy and comfortable they will flourish, and we will be able to get on and nurture their confidence, self-belief, music and dramatic talents. From that solid foundation comes the ability to help children love the examination process, dispelling the anxiety and apprehension that surrounds that word and the experience they may have had in school of SATs, GCSEs etc. And finally comes the success of passing their examinations have the qualifications to put on their CV and being able to rely on the accredited points for university and college. All this from an after-school activity! There are not many that can boast similar advantages, and this is what I love about Little Voices. A child really develops and really benefits! I love the network of people that I work with at Little Voices, the tutors that share their expertise and facilitate our pupil’s learning, but most I love witnessing the development of the individual child. A young man or young lady aged 18 years old who is professional, well-rounded, an effective communicator, able to present themselves and oozes confidence. The result of their training with Little Voices might lead to a professional acting or singing role or equally it will set them up for any other job of their choosing. I have had the pleasure of seeing our pupils go on to law degrees, business, politics, beauty therapy, broadcasting, journalism and everything in-between. I love that an afterschool children’s activity can give a child so many skills for life and they are learning these skills unknowingly through the medium of drama and singing, having fun and working as part of friendship group. Private 1:1 lessons just do not have the same benefits. They have their place and work alongside Little Voices, but that teamwork is essential in life. I love to hear feedback and it is communicated with us face-to-face, on Facebook, by email, over the telephone and in written questionnaires. I love to make people happy so listening to everyone within the organisation is imperative to our long-term success. I am also a great believer in ‘if you don’t ask you don’t get’ so I am asking you to feedback to us, like, share and comment on our posts on Facebook, spread the word about Little Voices to friends and family and help us go from strength to strength. You may know another child that would benefit from what we do and love Little Voices as much as your child does. 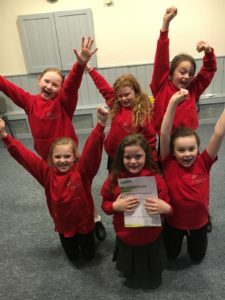 You might know a singing / music teacher or have a friend who is an actress and would be a suitable tutor for us to consider or indeed you may know someone who would be ideal for running a Little Voices centre as their business; full time or part time, embrace a new challenge and make it fit in with their current life. It is natural that as the founder and Managing Director of the organisation that I love Little Voices. I do. I wake up every morning and am privileged to love what I do however the reason for my passion and love is because I see what a difference we make to children’s lives. If you love Little Voices, please help us to help more children and reach out to more families across the UK. Our Principals and I rely on our loyal, supportive parents to help us spread the word lets get more people hearing about Little Voices and loving what we do this month! How can your child be successful? Conquer life with confidence! We talk about how Little Voices builds children’s confidence but what is confidence really and what does confidence enable you to do in adulthood? Wikipedia states that confidence is belief in oneself, positiveness, assertiveness, self assurance. It is true; if you have confidence then you can achieve! Having confidence leads to success and we are completely committed to facilitating every child’s vocal and dramatic learning so that they can be whoever they want to be and achieve and do whatever they want to do! A child’s future will be shaped by how confident they are. Their success will be a result of how confident they are. We strive at Little Voices and always have done to create a positive learning environment that nurtures a child so that they feel happy, safe and secure to share their ideas, their voice, their skills, make new friends and then their confidence starts to increase as they explore and push their boundaries, acquire new skills and excel in their examinations. The examinations are a critical part of what we do at Little Voices as they act as external verification for a child (and the parents and tutors) that they are doing well !!!! It is not just about rushing through the grades and increasing your C.V. from an early age although that is a really positive element of examinations. When we distribute the results from L.A.M.D.A. examinations it is superb to see the children’s faces and how proud they are of themselves and each other. It helps them to benchmark themselves and to appreciate that pushing their comfort zone boundaries and going through the examination process was all worth it! Another key life skill! Confident people start things. They are not shy about striking out on a new idea even when those around them are still pondering it. Confidence allows you to stand up for yourself in a fair and consistent manner. Otherwise, you may find yourself unheard or unfairly treated. Lack of confidence can lead to paralysis from fear. Fear of failure. Fear of what others think. Fear of the unknown. To succeed, you need the confidence to face and overcome your fears. Self-confidence means believing in yourself. Henry Ford said, “Whether you think you can, or you think you can’t — you’re right.” He was right. Confident individuals set the bar high and aim high. Lack of confidence leads to weak goals, setting the bar too low, and mediocre results. Confidence lets you know your limits and test them. By stretching your limits you increase them. You are stronger than you think! Confident people believe in success. And more importantly, they believe in their abilityto succeed. Believe in yourself. Believe in your skills. And most importantly, believe in your ability to succeed. As parents we all want our children to be happy and successful and certainly at Little Voices we share your desires for your child too. It is important to us to hear from you regularly and learn about how Little Voices is helping your child or what you feel they need more help with. Please keep in regular contact with us so that we can keep helping your child and every child to conquer life with confidence! SO, give your child or a child that you know the chance to shine this Christmas and find a Little Voices lesson near to you!